Home » Politics » Newsmaker: Is Rajdeep Sardesai set to be AAP's candidate for Goa CM? Newsmaker: Is Rajdeep Sardesai set to be AAP's candidate for Goa CM? 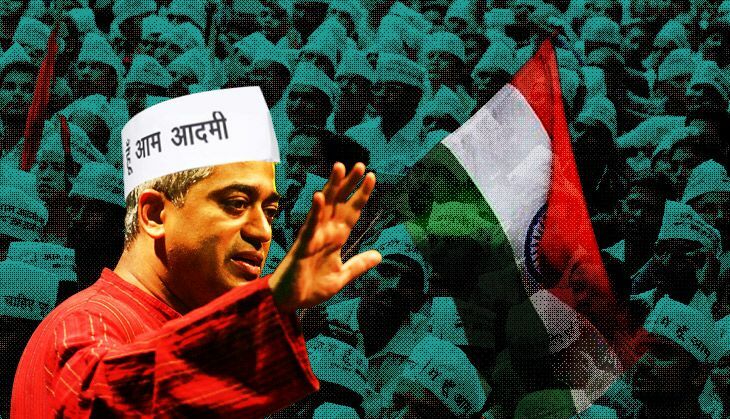 Is Rajdeep Sardesai leaving journalism to lead AAP's electoral foray in Goa? It appears AAP has landed a big catch to lead its next electoral foray. Nearly a year before assembly polls are held in Goa, AAP may have identified its chief ministerial candidate in celebrity journalist Rajdeep Sardesai. Sardesai, one of India's most well-known TV anchors, is currently consulting editor with the India Today group. He was seen at AAP's 22 May rally in Panaji, where the party's chief Arvind Kejriwal announced they would contest all 40 seats in the state in the coming election. Although Kejriwal did not make any announcement about Sardesai, his mere presence was enough to fuel speculation, which, it turns out, wasn't entirely unfounded. Sources in AAP confirmed to Catch that discussions were going on with Sardesai although the final decision was yet to taken. Sardesai, on his part, has denied it even as he toldThe Navhind Times that "if the people of Goa tell me to be chief minister then I am ready". Sardesai also sent out a series of tweets about Goa, and the problems the state was facing. Dabolim airport in goa just not large enough or equipped to take the traffic load. Airports with much less traffic are larger! Why? Airport project in north Goa in Mopa has been pending for years. Will make a difference once it's built. Will probably take years though. Social media is abuzz with speculation of Sardesai joining AAP ahead of the election, with many AAP-watchers talking about it on Twitter and Facebook. Political circles have taken note of the buzz around Sardesai and could not resist making quips. Sardesai was born in Gujarat, brought up in Maharashtra and has worked mostly in Delhi, but he identifies as half-Goan. His father, former cricketer Dilip Sardesai, was born in Goa. Sardesai says he has always been a Goan at heart. Destination Goa: Nice to be back home for a short break after heat and dust of elections! No place like Goa. He was crowned Goan of the Year by the newspaper Lokmat the same day as the AAP rally. He received the award from Chief Minister Laxmikant Parsekar, who later toldNDTV that the "sense I got is given a chance he (Sardesai) would love to contest from Goa".The term of the Goa assembly runs out on 18 March 2017, so the election is likely to be held in February-March. Given the strong anti-corruption sentiment in the state, AAP fancies a good chance at the hustings. AAP already has several leaders who are former journalists, including Delhi's Deputy Chief Minister Manish Sisodia, the party's spokesman Ashutosh, and Delhi Dialogue Commission chief Ashish Khetan. Incidentally, Ashutosh and Sardesai were colleagues at IBN 18 network, of which the latter was the founder editor. Sardesai and his wife Sagarika Ghose quit Network 18 in July 2014, two months after its dramatic takeover by Reliance Industries Ltd. He had reportedly said in his farewell letter to the staff that "editorial independence and integrity have been articles of faith in 26 years in journalism and maybe I am too old now to change!"